If I ask you what is common between American Punjabi's & Italians ? You can never think that my answer is going to be a green leafy vegetable, but yes that's what it is. Brocalli Rabe, Italians like theirs sauteed with extra virgin olive oil, garlic & red chilli flakes, well Punjabi's like theirs steamed, tempered with onion, garlic, ginger, tomatoes, green chillies & some dry spices and o'course cooked in desi ghee. Italians eat it with pasta, punjabis eat it with makki di roti, but no matter how they prepare it or what they eat it with, the common & most important part is they both love it. ( Today's post is little longer so please feel free to scroll down to the recipe if you want to....no body is watching you). I know what most of you must be thinking, what I'm talking.....it's saag or as most of you know it by the name "Sarson Ka Saag". After coming to America it took me almost 1&1/2 year to figure out that the mustard greens I always cook thinking as saag is not the one but the greens sold by the name brocalli rabe is the actual saag, and I always thought that saag is not flavorful here. How & why ? for that you have to trust your nose & not any biological name given to the vegetables. I figured it out accidentally while shopping in Korean store that why these leaves looks like Saag, so I gave the job to my nose & to confirm it, his nose too & finally when I brought it home, the moment I chopped it & steamed it, the aroma told me Saron da Saag means Brocalli rabe in this country......when bhindi can be Okra & not lady finger, baingan can be Eggplant & not brinjal than this is also possible. In the later years when I moved to different place where I had a big Indian grocery store stocked up with all fresh Indian veggies I never had to go & search for saag anymore.....not that I'm against mustard greens, I cook those also at least once a week but when I want Saron(Sarso) da Saag means I want it to taste like that too. If you like Bollywood movies then I don't have to explain what's the importance of Sarson da Saag.......just the name of it & Shahrukh Khan running after Kajol(bollywood movie : DDLJ) comes to mind. 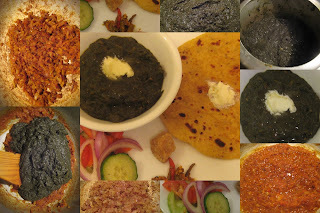 Whenever the name of Punjab(also known as India's bread basket, because it is the largest provider of wheat to India) comes to discussion, it's kind of impossible not to mention Makki di roti te Saro da Saag(Dish made with brocalli rabe & spinach eaten with corn tortilla kind of indianbread)......This post was due actually from many days but because I didn't had good pics, so I was kind of delaying it but now as lohri is here I can't delay it any more. It's the best time to post this recipe as Lohri : the liveliest bonfire festival, is very important festival of punjab and is celebrated every year on 13th of January and next day which is makar sankrant is celebrated in other parts of India by different names. Lohri(lori) is a festival connected with the solar year, it marks the beginning of the end of winter, confusing.....let me simplify, lohri is beleived to be the longest night of the year, so from next day the day light start to increase(so end of winters begin). For more info on Lori click here & here or for more interesting option rent bollywood hit movie "Veer Zaara" (again shahrukh khan but don't worry this time he's with sadi apni kudi preety jinta). I would like to wish all my fellow bloggers a very Happy Lohri/ Makar sankrant/ Pongal. For some reasons I always loved this festival may be because through out India each state celebrates it but with different name & different rituals. Now, coming to today's recipe, when you ask any Punjabi or for that matter any north Indian about saag its usually assumed to be sarson(mustard greens) ka ssag. In case of any other leafy greens are used for saag then it's kind of specific like bathua ka saag, chaulli ka saag etc. As I mentioned above if you want the original taste the brocalli rabe is the right choice but if you don't get it go ahead and use mustard greens by all means. Before starting the recipe another thing I like to say that there are hundreds of recipes for this same dish out there, everyone claiming to be authentic, but what my experience is basics are same but each & every household adjust it as per their taste so its kind of authentic to their household. Claiming one particular recipe to be authentic is too much of a statement, to me if it's sarson da saag & it not only looks but taste & smells like one it's authentic enough. On the part of looks, those who have eaten saag in any part of northern India will agree with me it's not pureed & it's not bright green instead coarse texture with dark green color. Pressure cook for one whistle, all the greens along with green chillies, ginger, salt & turnips(if using) with very little water. I would probably use 1/2 a cup if greens were allowed to drain well after wash. Some of you must be thinking who pressure cook greens, well for this recipe I do, alternatively u can steam it in microwave. Let it cool a bit, now using hand blender mash it coarsely. DO NOT PUREE IT, IF USING REGULAR BLENDER, DO IT IN SMALL PORTIONS, USE ONLY PULSE BUTTON, saag has some texture if you puree it you lost it. Traditionally a ghotna is used to mash the saag, it's kind of a pestle, a wooden one about a feet long with rounded(kinda half baseball) wooden piece on one end, which is used to mash the cooked greens. Ghotna in hindi literally means crushing something. At my mom's house this is my dad's duty as you need some muscles for this job, but it's worth it. While blending it add 3 tablespoon of corn meal & mix it. Put the cooker back on to the slow gas with no lid & let it simmer for around 10-15 minutes or so. We need to cook the flour so there is no raw flour smell, this process will bring creaminess to the saag. Keep stirring & be careful as at this stage it will start to splutter. Now after this stage for best results let it cool down keep it in the fridge for a day or if you are like me make a double batch & freeze half, refrigerate half. To get it ready for the meal, final step is prepare tadka, a very basic recipe which is used for most of the dals also. Heat some ghee in a kadai or a big pan, add cumin seeds to it, let them splutter add garlic, once it start giving u the aroma add onions. Saute them for a bit, once translucent add dry spices. After few seconds add tomato paste & tomatoes, let everything cook together. Once the tadka starts to leave ghee on the sides of the pan add saag mixture mix everything nicely & let it simmer for 10 minutes or so. Turn off the gas cover & let it sit for some time. Serving suggestions : The best way to serve it is with makki di roti, which I'm not posting today, because I don't have access to good makki da atta here, so I have to manage with regular corn meal now-a-days. But it also tastes good with plain prantha or naan. As for me I eat bowl full of saag with a dallop of fresh white butter. Traditionally home-made butter(makhhan) is used but since I'm in U.S.A, I manage with Land-0-Lakes All Natural unsalted whipped butter, quite close to home made one. Another things to serve with this dish, simple onion salad with some lime juice, green chillies & last but not the least Gur(jaggery). Many places you'll read traditionally lassi(punjabi yogurt drink) is served along with it but if it is day time meal then only. If it's a dinner affair with the cold weathers of north india no body can even think of lassi with this meal as yogurt comes under the category of cool foods. Note : I think of a ghee as healthy fat only, though I don't use it in my regular cooking but there are certain dishes I can't cook without it, so those of you who really freak out on the name of ghee go ahead & use your fav. cooking fat and also if u substitute ghee with some oil it'll become a Vegan dish. Now for the title, I couldn't think of any thing better than this. Here's my authentic Saron de Saag de recipe....go ahead make it at least once before this winter weather flies away, play Veer-Zarra movie and enjoy it with your family. That was a nice and interesting post and i didn't skip to the recipe and read the whole thing. The dishes look awesome and am going to get Brocolli Raab and try this out. Happy Shankrati/Lohri. actually loved de way u write...quiet interesting. will be back for more gyaan..till then happy cooking. This was so intersting. I am a real foodie and this was all new to me. I love in northern Ontario Canada where I have never heard or seen much of what you describe. Thank you for sharing. Spice..glad that I read the whole post, or else i would continue cooking mustard leaves as saag!! !..thanks for the info..I thought brocolli rabe was always leaves of brocoli..ha ha !! very interesting write up..actually when i go the chinese veg market here, you find various greens with unusual names ,so it requires some effort to find out what you are looking for..sarson kaa saag..never tasted,must try recipe..
@ Sage, do try it out sometime I'm sure all the Indian restaurents must be having this on their menu..
@ RC, I also developed that nose technique when I started shopping in Korean/chinese stores around 8 yrs. back & still don't know the names of many green leafy veggies they sell....I just smell them & if smells good buys them....I know it's weired what else to do....ha.. Very interesting! What a world I am discovering through your posting! Wishing you n your family a very Happy Lohri and lots of luck for 2010! hey stop by to pick up your award ! Aha! That makes sense now ... I always wondered why the darn Mustard leaves never gave me that authentic taste! Of course, it has a lot to do with not having the correct recipe too ... I would have never known cornmeal is used to give the saag that wonderful creaminess. Thank you for the amazing recipe and the great tips too ... I am going to try and find the original saag now! What a great recipe! I have bookmarked it because I want to try it, and because punjabi food is always wonderful! I appreciate for your lovely and interesting post. I liked it very much. @AshKuku, yes seasonal food is always more tasty.